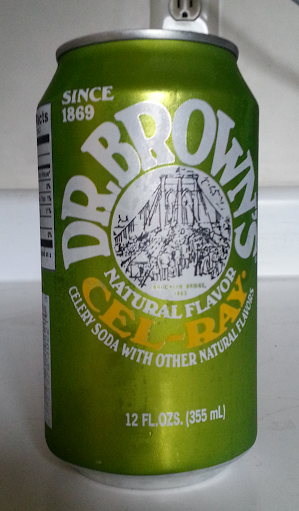 Cel-Ray is one of those completely off-the-wall flavors (celery) that turns out to be surprisingly good. 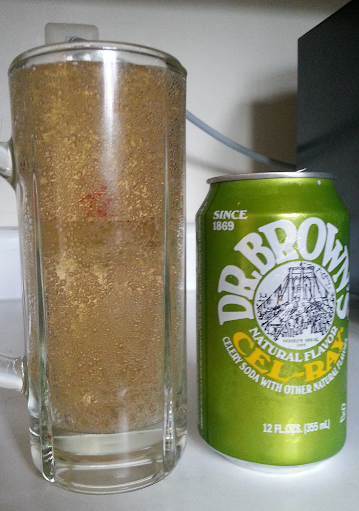 It quite definitely fits into the same niche as ginger ale (not ginger beer), but doesn’t seem as sweet as most. The flavor is principally from celery seed extract, and has a spiciness similar to that of the best ginger ales. It’s a lighter flavor, though, and (in my opinion) more refreshing. It can benefit from the addition of a small amount of lemon juice or lime juice, but far less than the 10% that I cut the Gosling’s Stormy Ginger Beer (from Jerking Around #4) with. The color is best described as amber, lighter than most ginger ales, and in the LED light in my dining room (where I’ve set up the laptop I’m writing this on), there’s perhaps the faintest shading of the color toward a celery-stalk green. Like most name-brand sodas, it’s more heavily carbonated than I find ideal. The carbonation is visible, with moderately-sized bubbles adhering to the inside of the glass, renewed as they break away and rise to the top. It doesn’t leave me with a burp bubble, though. Most of the time, I drink this “stand-alone”, for refreshment. It’s not out of place with a potato knish (with mustard, mind you), a corned-beef sandwich on rye, or any number of other Jewish classics. I routinely find this at many Jewish delis, including one on the Grand Central Food Court. I can sometimes find it in Stop-and-Shop, Fairway, or DeCicco supermarkets. If you’re in Brooklyn, NY, the iconic Junior’s Restaurant also serves it. Sold in 12 oz (355 ml) cans (singly in delis and restaurants, six-packs in supermarkets).